A terrible truth has been revealed to one man: the entire human race has been drained of every emotion except one-- fear. To bring life back to the world, Rom must embark on a journey that will end either in his own demise or a re-awakening of humanity. But to bring love and passion back into existence will also threaten the powers of the world with the revolution and anarchy that had nearly destroyed them previously. This is a new book by Ted Dekker and it rocks! Not particularly fond of fantasy but when it comes to Ted Dekker, I make an exception. 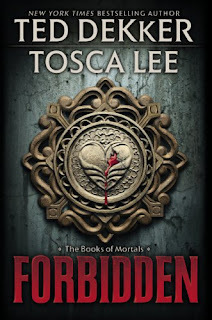 Forbidden is the first book of his new trilogy series. Set to publish in Sept 2011, it tells of a world in the far future when human race has no other emotions except fear. With no other emotions, human being might as well be dead and that's what human being are. When Rom was entrusted with a vial of blood, his world is turned upside down. His mother is murdered in front of him and desperate impulsive actions led him to consume some of this ancient blood as did three of his other friends. From there the adventure picks up as there are some timeline they have to meet, an old man who’s imprisoned in the dungeon to rescue and a nine year old boy whom they must find and brought into power in order for men to ‘live’ again. In between all these, they have to battle enemies sent to stop them as well as enemies within themselves. There’s something about Forbidden that I can’t really put my finger on. I feel there’s more message to the story than what meets the eye but at the same time, since it’s just the first book, I don’t really want to delve too deep into analysing the characters and representation in our world today, be it physical or spiritual. I really enjoy reading Forbidden for what it is to me now, an entertaining, intriguing story by a great storyteller. The second book is entitled Mortal and I can’t wait for it to be published. Perhaps, then I’ll delve deeper.